Eighteen months ago (blog, 26 Aug 2008), I congratulated the Guardian newspaper on its newfound ability to cope with the typographical complexities of Czech orthography. It was nice to see accented letters such as ě and ř correctly printed in the paper. Yet the “Grauniad”, once upon a time notorious for its then abundant misprints, still does not always get it quite right. 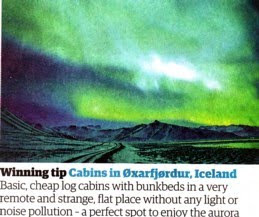 Its travel supplement recently carried a piece about an Icelandic destination it identified as “Øxarfjørdur”. Er… I thought it was only Danish and Norwegian that used the letter ø in their orthographies (oh, and Faroese). Yes indeed. The correct spelling of the place in Iceland is Öxarfjörður. Which brings me to the question of typing such letters when you need them in a document. Users of Word very often have no idea how to type them when they’re not immediately available on the keyboard. They don’t know about Word’s “keyboard shortcuts for international characters”. In Word you do Ctrl-', a to get á, Ctrl-', e to get é, and so on. With Ctrl-: plus the vowel letter you get an umlaut (diaeresis, trema), as in ä, ö, ü. With Ctrl-ˆ you get circumflexed vowels, with Ctrl-` grave accents. Even less well-known, I suspect, are Ctrl-/, o for ø and Ctrl-', d for ð. Every phonetician should know these last two, together with Ctrl-&, a for æ and Ctrl-&, o for œ.
It’s a pity that the Microsoft programmers stopped there: why can’t we have the Ctrl-' trick not just for áéíóúý but also for ćńŕśź? Why can’t we use Ctrl-^ for ĉĝĥĵŝŵŷ? And so on? The Windows operating system itself offers some further posibilities. In the UK we all know that to get the euro symbol, €, we do AltGr-4. We can also use the AltGr key to get acute accents on vowels: for example AltGr+a gives you á. In other locales there are other possibilities (see here). These keyboard shortcuts are determined by the operating system, so work in any application (whereas the Word ones only work in Word). Personally, I'd be lost without my Danish keayboard. It still can't do Czech consonants, though. Nor œ. My macbook with danish layout has a key for ´ and `. And one for ¨, ^ and ~. These keys work with all letters which they can be applied to. I remember that to be the same case with the danish keyboard layout for windows. Is it any different with UK keyboard layout? A lot of common international letter also has a hotkey in alt-[letter] on my mac keyboard, like e->é, u->ü, o->œ, p->π, s->ß, d->∂, k->∆, æ->ä, ø->ö, z->Ω, c->ç, n->ñ, m->µ. (The greek ones are possibly for the sake of matematics). And you can have the turkish ı with shift+alt+i. Symbols made with the Mac keyboard commands don't always travel cross-platform. Fortunately, in Leopard, Apple has provided an easily accessible Character Palette, which allows one to click on the desired IPA symbol, Latin character, punctuation mark, characters from non-Latin alphabets, and much else, and which I have taken to using over PopChar these days, for this blog and others. Since I've heard no complaints about my IPA characters not showing up, or looking peculiar, I assume Character Palette works as designed. I have never needed a w with an umlaut, but by golly, now I can have one! Please note that the UK and US physical keyboard layouts are somewhat different from each other. In the US, the character ` is at top left, under tilde. For IPA, when typing in Word for my own printed materials (or pdf docs), I just switch to the IPA-SIL keyboard layout, which is much, much faster for me. If I am missing a character, I can supply it via Character Palette, but that is seldom needed. As I hope I made clear, the operating-system keystroke shortcuts are OS-specific, and so quite different in Windows and Macs. Even within a platform, they differ from one "locale" to another, so are different in the US from in the UK and different again in Denmark or Japan. But I was mainly talking not about them but about the MS Word shortcuts, which I thought work everywhere, cross-platform and cross-locale. But I could be wrong. JW: MS Word shortcuts, which I thought work everywhere, cross-platform and cross-locale. They mostly do, I think, but there may be minor differences. On my machine, ä etc. are under Ctrl-Shift-: plus vowel, not Ctrl-: plus vowel. Similarly, æ and œ are Ctrl-Shift-& plus vowel. Without the Shift key, I just get the plain letter. Do you know how to type them "quickly"? It would be very helpful to me. - Set up a hotkey. Forgot how that works in Windows in general, or in Word, but it should somehow be possible. - Take it from CharMap, for which you could make yourself a quick-launch link. - Add the Hungarian keyboard layout, whatever your physical keyboard is. You can change between these layouts with Alt+left shift then. wjarek: on a UK keyboard, and I think on US and Polish keyboards too, you have to use Shift anyhow to get the colon and the ampersand. So when I say Ctrl-: or Ctrl-& I automatically imply pressing Shift. Anon 14:05: For a one-off Hungarian ő in Word I would use Insert Character. Or type 0151, highlight it, and do Alt-X. For ű it’s 0171. If I wanted them regularly I would assign them to “shortcut keys”, which you set up by clicking the relevant box in Insert Character. Does anybody know a quick way to get macrons over vowels, and inverted circumflex too? I'm thinking of Pinyin for Word/Windows XP. Macron letters are in Latin Extended-A. The other Pinyin things are mostly in the range 01CD..01DC, though not many fonts contain them all. Let’s try: āēīōūǎǐǒǔǖǘǚǜ. Pinyin-go! My trouble is that I have set up so many shortcut keys that I don't know what originally came with Word. Also I don't remember where I got it from, but I have a wonderful keyboard layout called United Kingdom Extendedˌ which e.g. makes ` into a dead key. So my keyboard layouts bear no resemblance to the ones on the Wiki link. But I don’t think they ever did, and I'm sure that € has been Alt+4 from the start. Of course AltGr+4 works as well, as it works in any application, like AltGr+a etc. > why can’t we have the Ctrl-' trick not just for áéíóúý but also for ćńŕśź? Why can’t we use Ctrl-^ for ĉĝĥĵŝŵŷ? And so on? We can too have the Ctrl+ trick for those. They are among the "Shortcut keys" I have set up under Insert Symbol. And so are the vowels with 1st and 3rd tones in Pinyin. i.e. the ones with "macrons over vowels, and inverted circumflex"
That is very interesting and I shall save this to my hard drive for future reference. However, I came on this blog today (Burns day) hoping to see some analysis of the great Scots language that Robert Burns made famous. You are a true Englishman! "I was mainly talking not about them but about the MS Word shortcuts, which I thought work everywhere, cross-platform and cross-locale." No, your Word commands appear to be platform-specific - or at any rate, specifically not for Macs! I don't even know if there are Word commands for Mac. Since Mac shortcuts work across all applications on a Mac, including Word, that's all I've ever needed to use. The only problem arises when I need to send something somewhere that is readable cross-platform. So far, Character Palette has worked best for that, but it isn't a foolproof solution. Amy, Character Palette is just an input method (like the Character Map of Windows), not an encoding system. The encoding system with which all modern computers are compliant is Unicode. As long as you can find some way to get a Unicode character into your document it should be readable by anyone who has a suitable font installed. Does Character Palette display Unicode numbers like Character Map does? And like Word's Insert Character does? 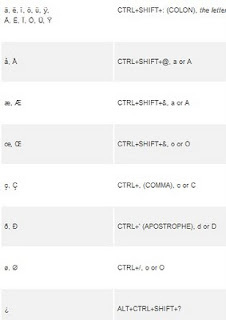 The full list of character shortcuts in Word for Windows can be found here: http://office.microsoft.com/en-us/help/HP012303781033.aspx. It also includes å, which I don't think John mentioned. @Kilian: Thanks! Neat! There's a shortcut to ß which I didn't know. But it's a very fussy shortcut to ß! I've set up Alt+s by the options I've explained above: Goto Tools > Insert > Symbol, or make a button on a toolbar for it as JW suggests (I have Ctrl+Shift+S, which may be in the original Word template, or I may have made it myself), goto Shortcut Key bottom LHS, and make your own! Character Palette doesn't display numbers. But it does insert Unicode characters, so I assume there are codes involved, running around somewhere in there where I can't see them! Why would I want to bother about numbers when there is a simpler way? The Mac interface makes everything much easier. The OS has been Unix-based for some time now, though; so code geeks can have fun down at Terminal level. I don't want to know about code. I want to click on symbols and have them appear; the Character Palette lets me do that. You can't use PC tricks on a Mac, any way you slice it. Word for Mac is different from Word for PC; some commands are in different menus, some features and commands aren't available, and there are no keyboard shortcuts just for Word. I've worked on PCs, by the way; both DOS and Windows. Only when I was doing office temp work, back when I needed a day job to support my acting habit, so I never had to deal with special characters on a PC. But what you describe seems terribly clunky to me. Macs make everything easy; that's why I like them. Indeed, none of the Ctrl commands work in Word for Mac (at least not in the 2008 version). But that is no problem when you have the native mac option of using option-e-e, etc., as Amy mentioned, or of switching to a different keyboard input source, or of using the character palette. I think Windows applications began supporting Unicode after Mac applications did, which may have been the readability problem Amy came across. With modern software and fonts, there should be no problem. @John: the Mac character palette does display the unicode numbers, and there are various ways of sorting and categorizing the symbols. Enlightening details, Stephen. I was just going to say that I remembered options with Option from my blissful Mac days before the horrors of MS were visited upon me. They have taken so many years off my life that my life expectancy must now be a minus quantity, but at least you could fight them from DOS through to XP. Vista made that impossible, and I wrote a ten-page jeremiad on the more glaring idiocies and outrages of it. Anyone got any ideas what to do with it? But people found even that a seamless web of wonders, so I am taking absolutelno notice of the blandishments about Windows 7. I shall have to pin my hopes on the claim that it has been much slimmed down, as XP is being attrited by the day. Anyway Amy, I'm pretty sure that if you implemented those options with Option along lines not too different from the PC as far as I remember, you would find the process is not particularly clunky, and the actual entering of characters would become clunk-free. That would not be a description of wrestling with a picky mouse to pick them from the PC Character Map or Word's Insert Symbol, and I can't see how it would be for Character Palette either. For á, é, í, ó, ú, I type Ctrl+Alt+[vowel], but this doesn't work for ý, which is Alt+0253. This works in Word and Open Office doc. @Stephen: "the Mac character palette does display the unicode numbers, and there are various ways of sorting and categorizing the symbols." I've found some of the sorting choices, but somehow not the numbers. Mind you, numbers give me hives, so I do try to avoid them. But it would probably be useful for me to know where the little critters are. If nothing else, I could follow a few of John's posts better. How do you find the numbers? @mallamb: If I've understood you correctly, then you're right: I find Character Palette clunky by comparison with keyboard commands. OTOH, it does give me reasonable assurance that the characters I type here will appear correctly for most readers. I've discovered that with the Mac shortcuts, sometimes I can see my characters correctly, but other readers can't. This whole thread is building my character, but that's another issue. @Amy: In my character viewer, I can see the Unicode numbers by selecting "code tables" from the scroll-down menu at the top.